Rustam,10, works at an aluminium factory, where about 25 children are employed, many of them working for 12 hours a day. Photograph: Reuters. 8,044 children (aged five to 17) are estimated to be working in the garment industry in eight wards of the National Capital Territory of Delhi. 87 per cent of these children were working in household units and 13 per cent at addas (small-scale commercial units). 82 per cent children said that given an opportunity, they would not like to attend school. These are some of the key findings of a study conducted by Save the Children, a child-rights organisation working with socially-excluded children. As many as 92 per cent of children working in household units were enrolled in schools, but 22 per cent of them said they were not interested in education. 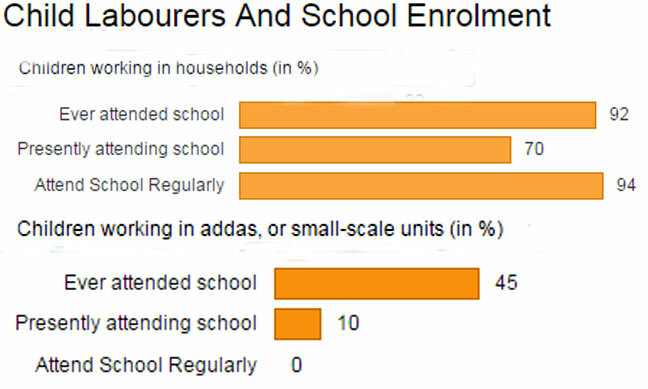 In addas, children were either not enrolled or did not attend schools. About 78 per cent of children knew about their right to free and compulsory education, and they also knew that child labour is illegal. Yet, 92 per cent of children said they were happy with their work. It is possible the children did not say what they really felt, as the study noted, or they knew little of a world they had never experienced or were happy to be earning at that age. But more than 40 per cent of respondents did not want to continue in the profession and said they would like to pursue medicine, engineering and law - if they ever got the chance. With Kailash Satyarthi winning the Nobel peace prize for his work against child labour, there has been renewed attention on the issue in India, which has 11.7 million child workers, according to Census 2011, the most of any country. There are 168 million child labourers between the age group of 5-17 years worldwide, which is 11 per cent of the world’s child population, according to an International Labour Organization report. 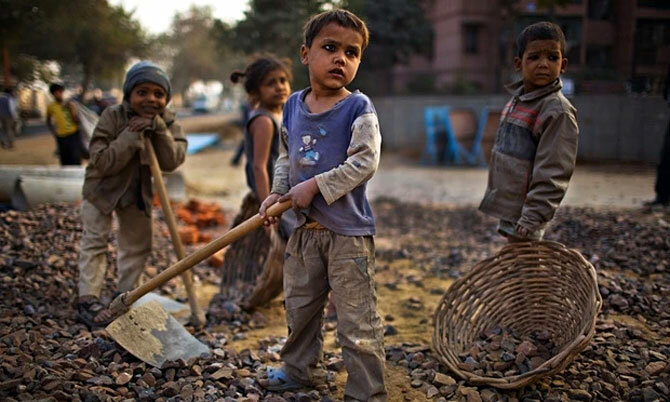 India accounts for the largest number of child labourers worldwide with 11.7 million, according to the 2011 census. 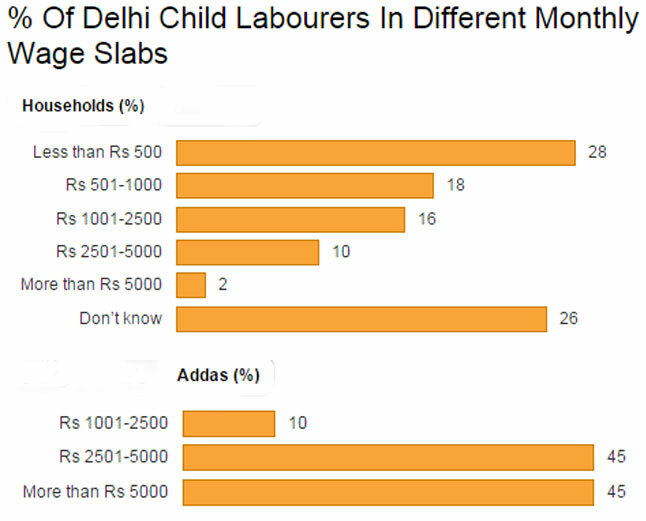 The study found children working in three districts: East Delhi, South Delhi and South East Delhi. Children under the age of 14 cannot be employed under Indian law. Most of the children who worked in garment units had migrated from Uttar Pradesh, Bihar, Jharkhand and West Bengal. Of 170 children surveyed, 102 were girls. More than 60 per cent worked because their families needed the money. 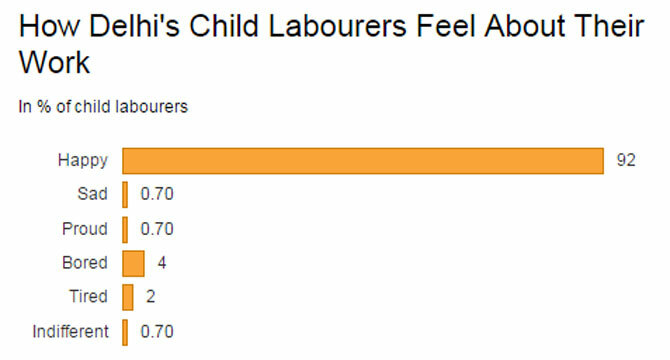 About 59% of child labourers work in agriculture, but the issue spans sectors including manufacturing and mining. Photograph: Daniel Berehulak/Getty Images. 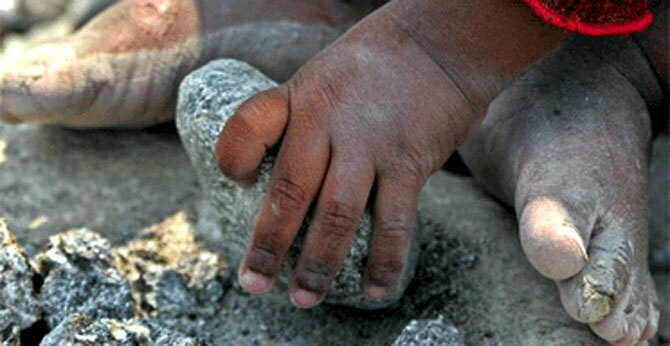 Child labourers are exploited the most in addas. They work for 12-14 hours a day, and mostly live at the work place. They visit families once in six months or a year, depending upon the adda owners. Children in household units enjoy a bit of liberty. They work for three to four hours a day, if enrolled in schools. If not enrolled, they work all day. The study found that 92 per cent of children working in household units were enrolled in schools that they attended regularly. Children in the garment industry worked at thread-cutting, stone-pasting, embellishment, embroidery, zari work, packaging and delivery. This includes skill, semi-skilled and unskilled work. The majority of those in household units are paid less than Rs 500 per month. While their parents are paid, children sometimes are given money for their expenses. So, technically, children don’t get paid for the work they do. In addas, 45 per cent of children get between Rs 2,501-5,000 per month and 45 per cent get more than Rs 5,000 per month. Most of them get paid on the basis of pieces they make or work on. After 35 to 40 years, the body begins to give up, adda owners told researchers, with eyes and hands not as sharp as they once were. Children complain of body ache, back pain and weak eye sight, and they are always at risk from the sharp tools, cutters, needles and machines that they work with. Child labour laws are routinely ignored in the rush for profits. Photograph: Desmond Boylan/Reuters. There is no medical assistance at household units or addas. The Save The Children study reported some instances of physical, verbal and sexual abuse at addas. While 11 per cent children reported abuse at home workplaces, only 6 per cent children at addas complain of abuse. That does not mean abuse is low. It is likely that reporting of abuse is low, with children possibly reluctant to even admit it to the research team.